Electrostatic Voltmeter or sometimes called Surface DC Voltmeter are instruments that measure voltage even without the actual transfer of electric charge. These devices can measure voltages through close proximities of the probe, to the measured quantities. This device is an answer to the uncertainty principle problem of measuring data. When measuring voltage distribution on a dielectric surface, any measurement technique that requires charge transfer, no matter how small, will modify or destroy the actual data. Thus Electrostatic Voltmeters may come in handy. 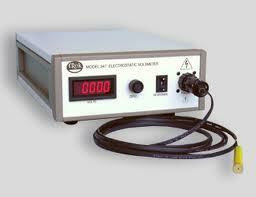 Below are links on the topic Electrostatic Voltmeters to help you understand more on the topic.